Today’s puzzle is an other trick opening box. From the puzzle classification list by Slocum this is the family where the goal is to take apart the assembly. 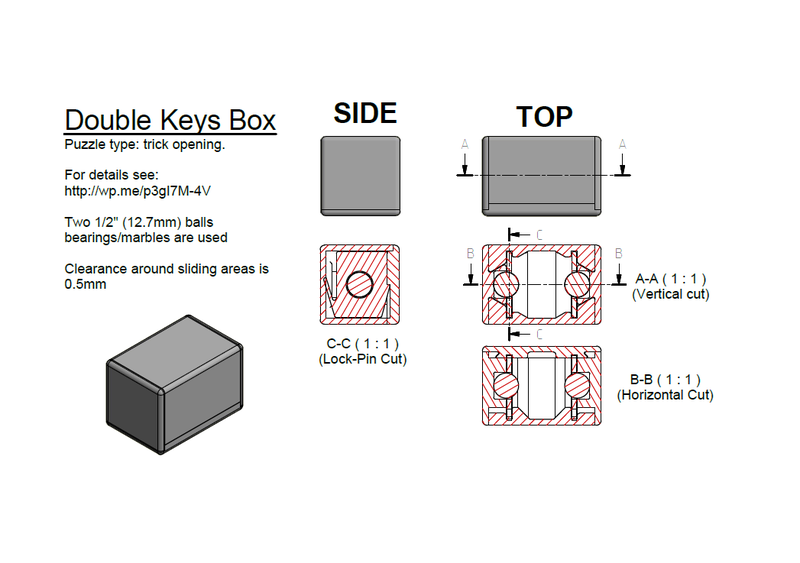 In this box you have a hidden mechanism that let you open it if certain steps are followed. The box is rather plain for outside, but the interesting part is the internals. With 6 sliding pieces this is by far the most complex assembly I’ve built to date. As you can see, the master sketch part starts to be a bit crowded! 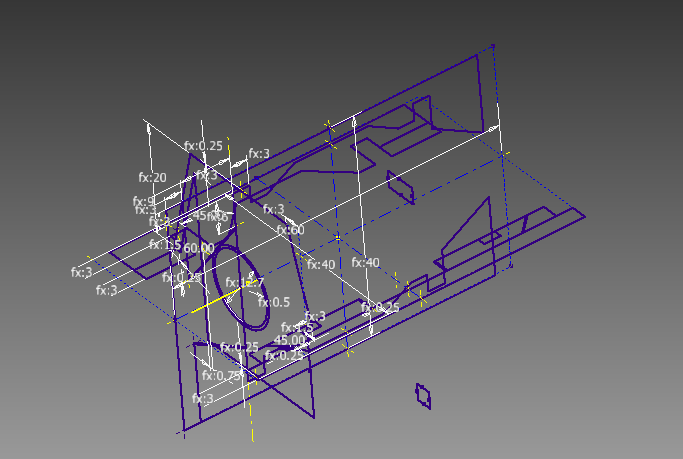 In on of my next post I will probably describe the process of creating complex assembly and shapes with Inventor. The assembly instruction gives a better overview of the different pieces. The Main body (box) is were all the other pieces are sliding into. 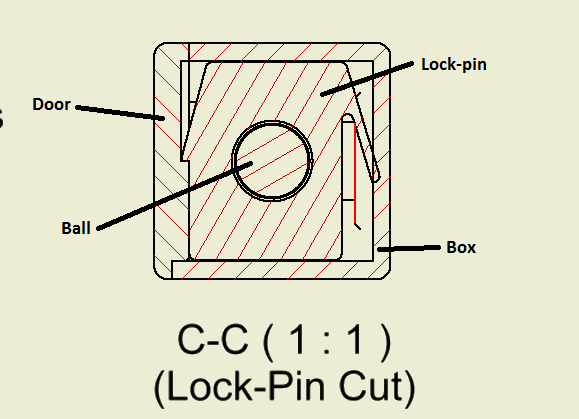 On both side a panel and a key have a round slot to catch one of the 1/2″ marbles. The pieces are symmetric so that the same geometry can be reused. Once everything is pushed inside, the door slide from the top. To keep the door shut the pins have a spring bar that I saw in another Thingiverse object by Ttsalo. 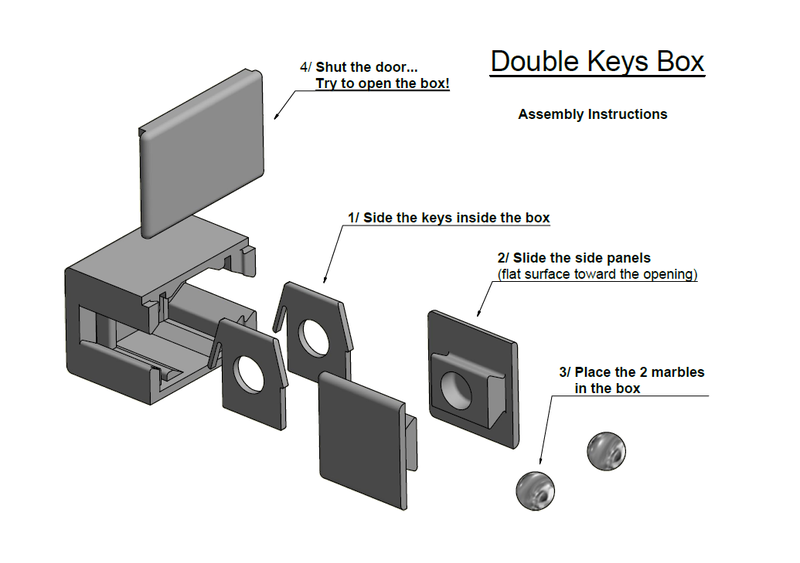 As I do not have a printer yet, I use the schematics and cut views to make sure everything will work. As always I’ve uploaded the STL on Thingiverse here. This entry was posted in 3D printer, Autodesk Inventor, Puzzles and Brain teasers, STL files and tagged 3d printing, Autodesk Inventor, brain teaser, stl files, Thingiverse on April 10, 2013 by damienideas.